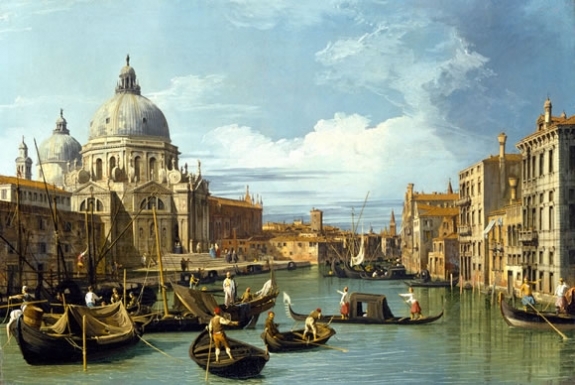 The National Gallery of Art, Washington, will present 21 of Canaletto’s finest paintings of Venice with 34 by his most important contemporaries, including Gaspar Vanvitelli, Luca Carlevarijs, Michele Marieschi, Bernardo Bellotto, and Francesco Guardi, in Venice: Canaletto and His Rivals, on view from February 20 through May 30, 2011, in the East Building. These dazzling cityscapes represent the best view painters of Venice—each responding to the city in his own way, and each competing in a market driven largely by the British Grand Tour, at its height during the 18th century. “Unlike previous exhibitions on Venice or Canaletto, this one focuses on rivalries that pitted the artist against his fellow painters. Visitors to the show will have the opportunity to compare their differing portrayals of the same or similar sites or monuments. We are deeply grateful to our supporters for making this landmark show possible,” said Earl A. Powell III, director, National Gallery of Art. The entrance to the exhibition will feature a 35-foot-long gondola that once belonged to the American painter Thomas Moran and is now in the collection of the Mariners’ Museum, Newport News, VA. One of the world’s oldest gondolas, it will visually “transport” visitors to the lagoon city celebrated in the views of Canaletto and his rivals.